« Killing the Angel … again! 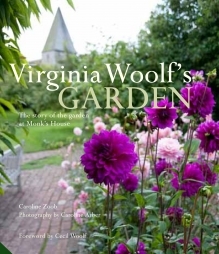 With the exception of Virginia and Leonard Woolf themselves, Caroline Zoob and her husband Jonathan are the only two people who have had access to the garden at Monk’s House year in and year out. But we can all get a glimpse of the year-round beauty of that special place through Virginia Woolf’s Garden: The Story of the Garden at Monk’s House. As Zoob puts it in her Introduction, the couple “opened the curtains each day to see the garden spread out below, still shaped according to Leonard’s inspiration” during their decade-long tenancy of Monk’s House, from 2000-2011. Zoob’s 192-page book is divided into seven chapters that tell the story of the home and the garden’s evolution since 1919, when the Woolfs discovered the home in Rodmell, Sussex and were immediately enamored of the garden. 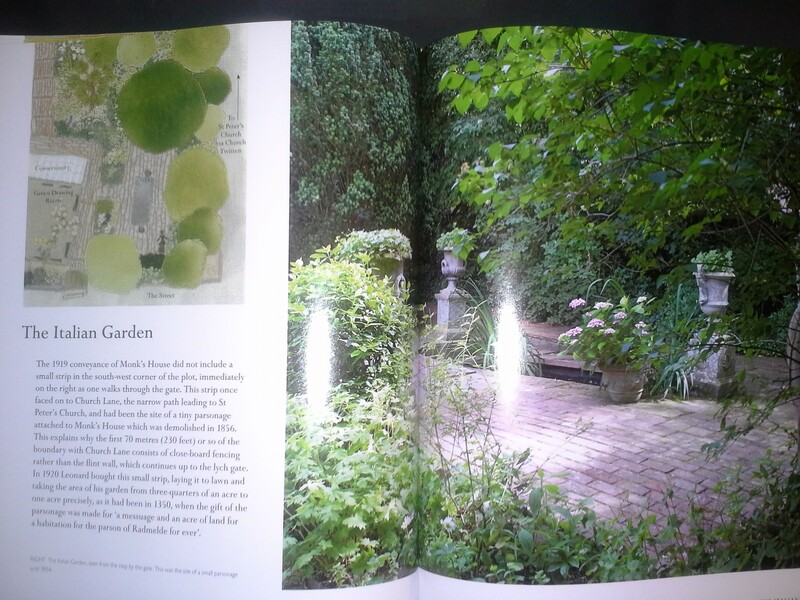 The hefty book gives us a tour of that garden and fills in the background as well. And at the end of each chapter, a different garden “room” is described in detail. Featured throughout are full-color photographs by Caroline Arber, who was a frequent visitor to Monk’s House during the Zoob’s tenure at the home. The photos include wide views of garden elements such as The Flower Walk — the borders running from the lawn steps to the Orchard — and crisp close-ups of individual flowers, such as Leonard’s beloved roses. They show Monk’s House and its garden transformed by the seasons — with the bursting bulbs of spring, the vibrantly colorful blooms of summer and the snow-capped garden sculptures of winter. Archival photos of the Woolfs and their friends at Monk’s House are juxtaposed alongside photos of Monk’s House in the present day. An old photo that I had never before seen pictures Virginia standing outside her first writing lodge, which was converted from a toolshed. Zoob found the photo at Sissinghurst, and although a cropped version was printed in Volume 3 of Woolf’s Letters, the untrimmed new version includes the loft ladder. 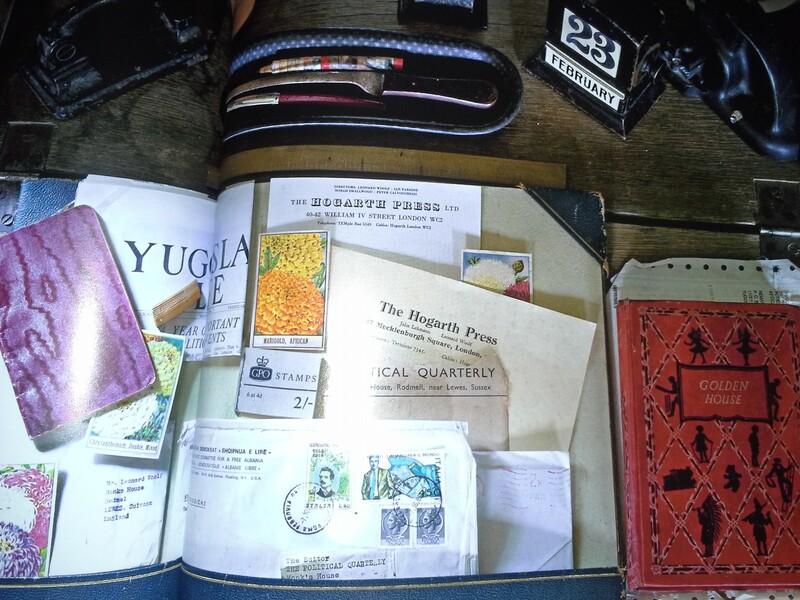 Leonard’s desk, as pictured on Pages 122-123. Interior close-ups of such things as both Virginia’s and Leonard’s writing desks are a special treat. Others show intimate views of details not available to visitors to the house. One includes an oak step leading toward the kitchen that is visibly work with use. Another is a 1970 photo showing the kitchen before the National Trust remodeled it for tenants. Another charming element of the book are the garden layouts. At first glance, they all look like watercolor sketches — and some of them are — but upon closer inspection it is clear others are textile art — a combination of embroidery and appliqué with inserted text. The Italian Garden, pictured in fabric art at left and in a photograph at right. The book, an indispensable treasure for any Woolf fan, Anglophile, or gardener, will be available in hardback from from Jacqui Small Publishing Oct. 14. Zoob, an embroiderer and textile artist, is the author of The Hand-Stitched Home and Childhood Treasures.